Targets your abdominal muscle to raise the body temperature and promote sweating during exercise, which can help you achieve your goals of reducing your weight and maintaining a perfect shape. 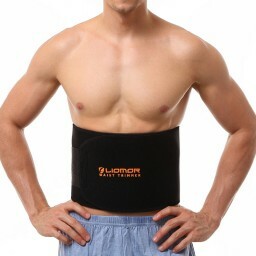 BURN OFF CALORIES TO LOSE WEIGHT - The Liomor waist trimmer belt targets your abdominal muscle to raise the body temperature and promote sweating during exercise, which can help you achieve your goals of reducing your weight and maintaining a perfect shape. PORTABLE SAUNA FOR YOUR WAIST - Our weight loss belt is designed like a portable sauna, it can help improve blood circulation and get rid of toxins by promoting sweating while exercise. ANTI-SLIP & COMFORTABLE - Made of premium flexible neoprene to wrap your waist comfortably and the ab belt’s grid inner lining can repel moisture and prevent slipping during workout. SIZING - 8" x 41" trimmer belt fits up to 39" in waist size. The adjustable Velcro closure can accommodate users with different waist shape and size.